This week we have been working on the letter L. Kaitlyn has been using her letter flash cards and puzzles to practice all of the letters we have learned so far. we start each day out with a review. 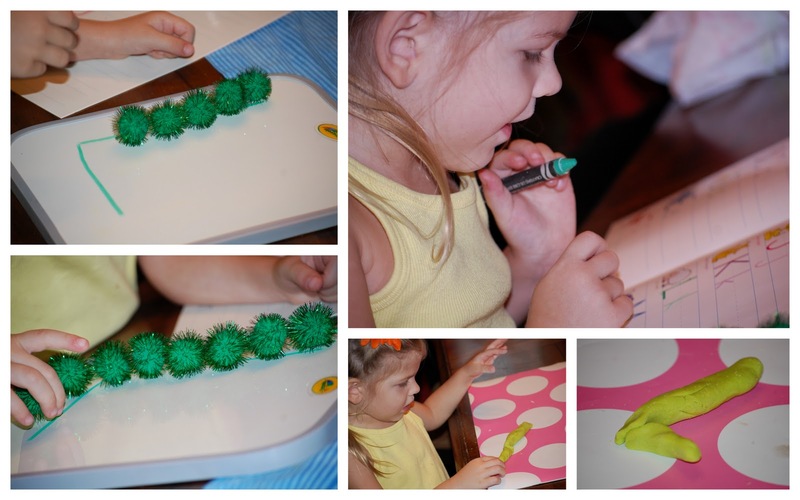 Today Kaitlyn used her pom poms to trace the letter L, she also used her homemade fundough to make her letters. We practiced her handwriting and trying to stay on the line while tracing her L's. Another fun way to review letters is by using a paint tracing bag....Fill a ziploc bag with some paint, close it tightly and get all of the air out while sealing it closed. 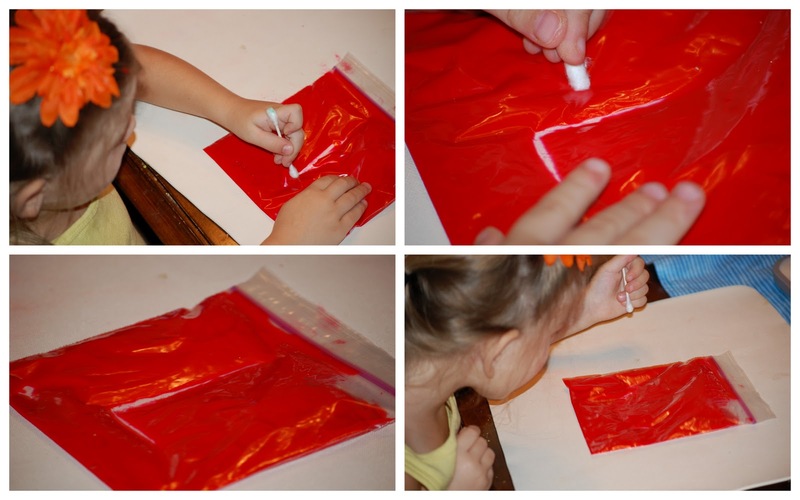 Have your little one use a q-tip to trace the letters onto the bag, the letters disappear quickly and are a great way to practice using some different materials. We had fun cooking up some patterns in the kitchen this week. We made some sugar cookies and separated the dough into three bowls. 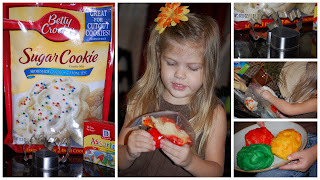 kaitlyn and I read a book about Fall trees so I asked her what colors we see in fall she chose, green, red and yellow so we used some food coloring to dye the dough. Kaitlyn rolled it out and flattened it with her hands. 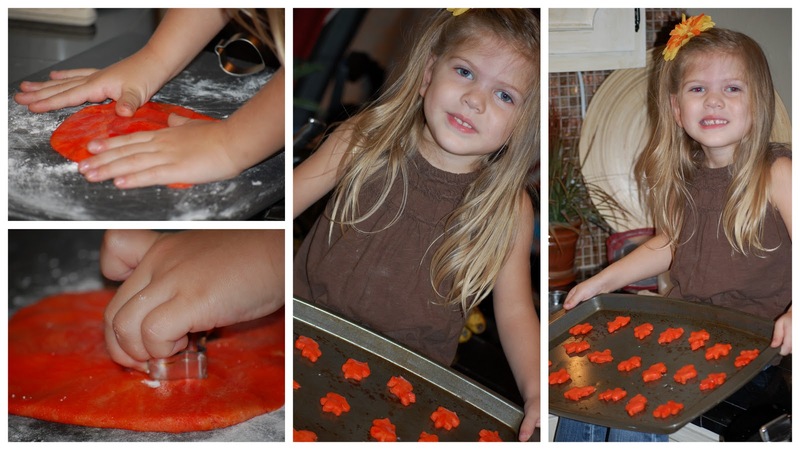 Using some small leaf cookie cutters she cut out three different types of leaves one type for each color. All week we have talked about colors. We have learned about fall leaves and how they change colors. This activity is a lot of fun and illustrates how mixing two colors can make different colors. First you take a large piece of wax paper, then you squirt some hand sanitizer onto it. 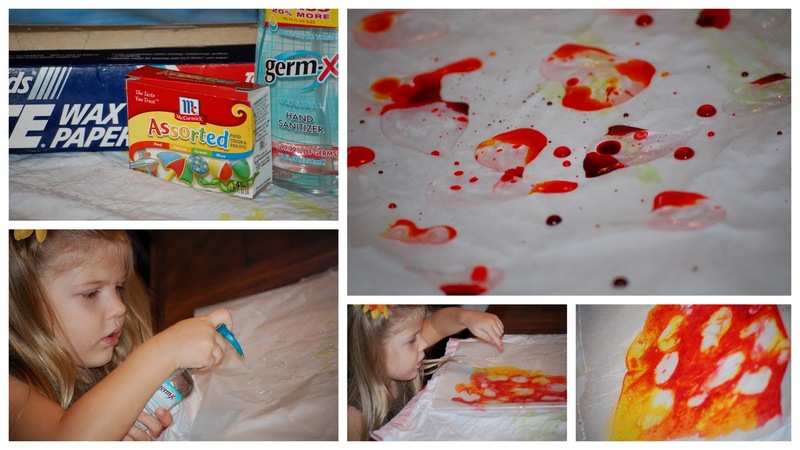 Then take some food coloring, we used red and yellow, add a few drops of each. Then fold the wax paper over covering the colors. Kaitlyn mixed the colors by practicing her circles. She drew large and small circles with her finger mixing the colors as she went. 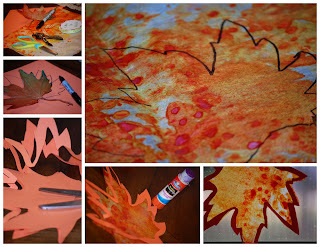 Tomorrow we will be using this to make some Fall sun catchers.....so check back to see pictures! we set it out flat to dry over night. We made our L page for our ABC Book. Kaitlyn made a leaf rubbing using several leaves we found outside. I found it helpful to use double sided tape to stick these onto the table so they wouldn't shift while she was doing her crayon rubbing. I wrote the letter L using a sharpie marker and had Kaitlyn glue her smaller leaves onto the L.
All week we have been getting ready for fall we have enjoyed nature walks and many books about the changing of the seasons. 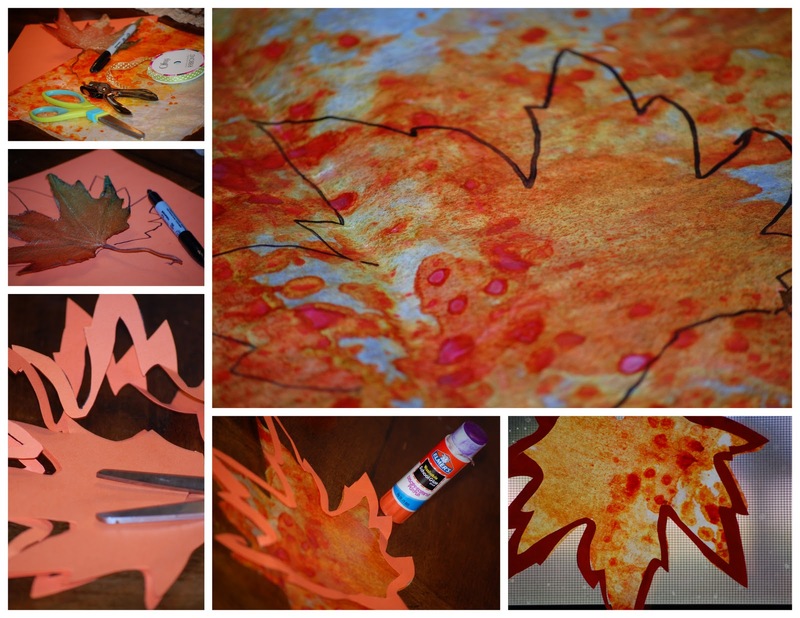 Today we worked on some colorful and very messy art projects to get the house all ready for fall! 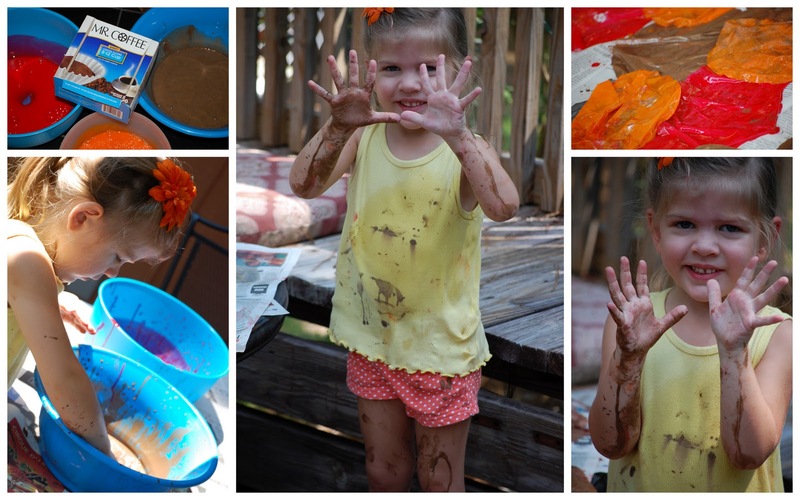 Get three large bowl and fill with 1/4 cup of paint we used red, brown and orange. I also mixed some bronze paint in with the brown to give it some shimmer. Then I added some water to dillute the paint. We took our containers outside and Kaitlyn took coffee filters and dipped them into the paint bowls, after she dipped them she wrung them out and then we set them out on the deck to dry. Setting them on wax paper works best for easy removal after drying. While the kiddos were napping I put my crafting skills to work, I heated up my hot glue gun and got busy! Step 1: Take a cardboard circle ( I use cake rounds) and cut out the center. 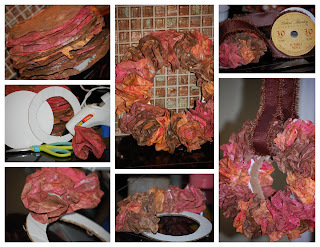 Then take the painted coffee filters and bunch them up at the middle. Hot glue them onto the cardboard circle. Step 2: Go around the whole circle in teh same fashion. Step 3: Add som ribbon, loop it through the wreath and hot glue together, hang in front of a miror for a dramatic fall look! I had some left over coffee filters so I added them onto some twigs we collected on our nature walk. 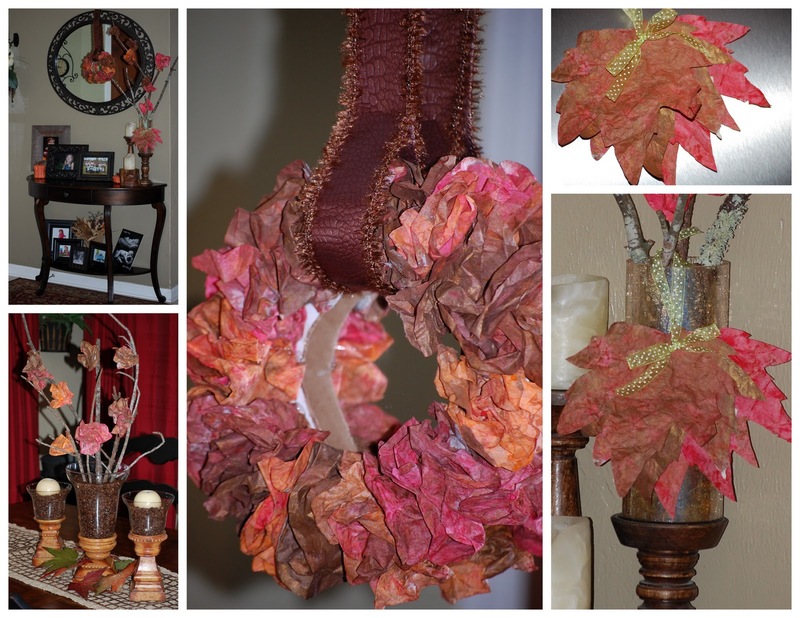 They made for great table decorations in the dining room! The house is all decorated, the cinnamon candle is burning in the kitchen, my favorite sweater is hanging in the closet.....now if the cooler temperatures could just arrive! The Letter O is for Owl! Hoot Hoot!